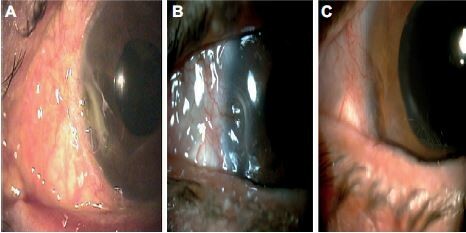 Materials and methods: A retrospective case-series study design was used including six patients (eight eyes) diagnosed with glaucoma who received surgical (nonpenetrating deep sclerectomy and/or trabeculectomy) and medical treatments (hypotensive eye drops) to control intraocular pressure (IOP) and who developed secondary OSDs, unresponsive to conventional treatments. Patients were treated with PRGF eye drops (four times a day). Outcome measures were ocular surface disease index (OSDI), best-corrected visual acuity (BCVA, in logarithm of the minimum angle of resolution), visual analog scale (VAS), frequency and severity of symptoms, and IOP. The safety of the treatment was also evaluated. Results: Six patients (seven eyes with open-angle glaucoma and one eye with uveitic glaucoma) treated with PRGF eye drops were evaluated. Mean age was 71 years (SD=7.2, range 58–79 years). Five were female and one was male. The mean treatment time was 21.8 weeks (SD=9.0, range 12–36 weeks). The mean time to reach closure of the corneal ulcer was 14.5 (SD=5.5) weeks. A statistical significant reduction in OSDI scale (50.6%), VAS frequency (53.1%), VAS severity (42.0%), and a 41.8% improvement in BCVA were observed (p<0.05). IOP also decreased by 16.6% (p=0.010). Only one of the six patients reported itching in both eyes as an adverse event (AE); however, the patient continued with the PRGF eye drops until the end of therapy; the remaining patients did not report any AEs during the follow-up period. Conclusions: In patients with glaucoma and secondary OSDs refractive to conventional treatments, the treatment with PRGF eye drops could be considered a possible therapeutic option, because it demonstrates an improvement in the signs and symptoms of the ocular surface, as well as a better control of the IOP. This is an initial research work that can open doors for future research to confirm these findings.